New 2019 Nominations for Veeam Vanguard Program! Veeam Vanguard nominations for 2019 are now open! As 2018 comes to a close, we are proud to have completed the fourth year of the Veeam Vanguard Program. The Veeam Vanguard Program is Veeam’s global, top-level influencer program. Each Vanguard is nominated (either by themselves or others) and selected by the Veeam Product Strategy team. There are Vanguards of all types and all backgrounds — what will the 2019 program have in store? Update 3-January 2019: Nominations have closed! Look for this post again in late 2019. Nominations close on January 2nd, 2019. We have grown the program over the years. At Veeam, we have added different technologies; and new influencers have an opportunity to be discovered. The Vanguards have unparalleled external access to Veeam initiatives, product updates, betas, incredible swag and more. 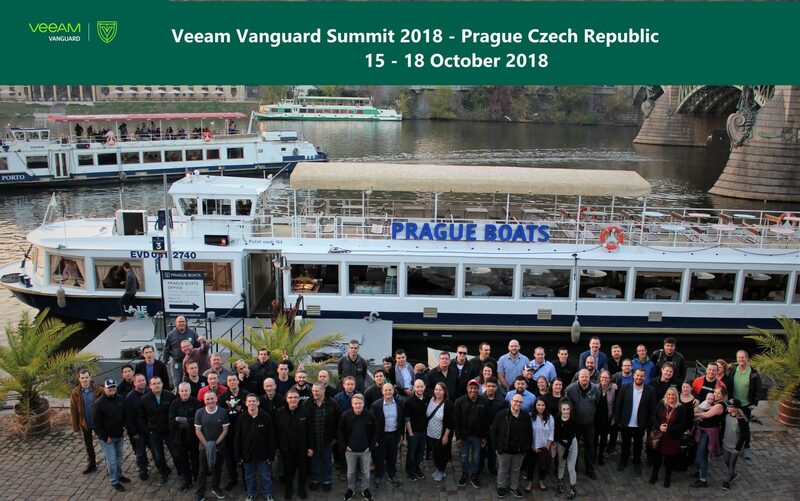 One of the highlights of the annual program is the Veeam Vanguard Summit. This year, it was held in Prague and we hosted over 40 Vanguards for a week of technology and community fun. One of the best ways to describe the Veeam Vanguard Program can come right from the Vanguards themselves. Who can apply to be a Vanguard? Anyone active in a technology community. Can Veeam employees be awarded Vanguard status? No, but employees can nominate persons for consideration. Former Veeam employees who have been separated for more than 1 year are eligible for nomination. What criteria are needed to be awarded Vanguard status? The criteria are decided by our team that looks across communities to find the persons who embody our brand the best. How will nominees be notified of the result? The Product Strategy team (my staff and I) are going to review the nominations after the registration closes, and then we will deliberate the results. Look for communication either way after that. If you see a Vanguard in the wild, let us know via nominations or nominate yourself. Nominations will close on January 2nd, 2019!